Bretons are famous for their skills in diplomacy and trade. The people of High Rock are rewnowned craftsmen, but above all else Bretons are gifted in the arcane arts. Bretons have a touch of elven blood running in their veins, giving them a natural prowess in magic. This sets them apart from the rest of the human races of Tamriel. The symbol of Bretons is a lion, which is a theme that is both related to Bretons and the Daggerfall Covenant. The Lion Guard is an elite knightly order of Bretons who serve High King Emeric, the ruler of Daggerfall Covenant. 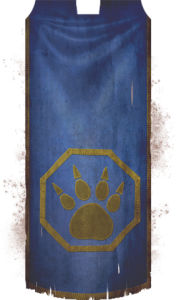 The Lion Guard bares the symbol of a lion’s paw on their banner. Bretons are the dominant race of Daggerfall Covenant. They are joined in the alliance by Orcs and Redguards. In Elder Scrolls Online Bretons receive an increase in experience gained with Light Armor skill line, and have increased maximum Magicka thanks to the racial skill Gift of Magnus, which they share together with the High Elves, another magic-inclined race. The passive racial skill Spell Resistance increases the spell resistance of Bretons. To complete the ultimate list of the magicka-inclined human race’s racial skills, Magicka Mastery reduces the cost of spells. A brief look at the racial skills of Bretons leaves no room for doubt: the Bretons are a great choice for those who wish to make frequent use of magic in combat. Increase XP gain with the Light Armor skill line by 15%.